OK, so everything from meteors to EMP’s to zombies are being talked about as imminent threats and reasons to get prepared for Doomsday. People preparing for doomsday refer to themselves as “preppers” and they’re getting some pretty prominent press these days including a couple of Discovery channel shows. Most preppers will agree that arming yourselves for the apocalypse is one of the many things you need to do to survive whatever threat is coming. 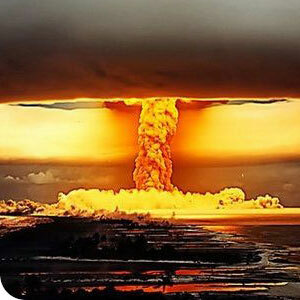 So, if we’re going to survive the apocalypse, what doomsday weapons are the “must have” firearms for such an occassion? Whether fighting off looters, rabid wildlife, aliens or brain eating zombies, you need a compact, easy to fire weapon you can keep on your person at all times. A semi-automatic pistol would be great choice for the first of your doomsday weapons. While the old .38 special or Dirty Harry’s .44 magnum are options, semi-auto handguns are quicker to fire, typically have less recoil and offer more capacity than shiney wheel-guns. 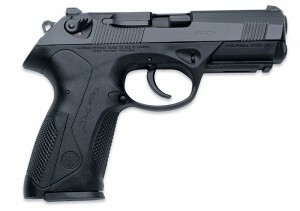 Something like the 9mm Beretta PX4 Storm is a perfect sidearm. Of course, any 9mm semi-auto would work: a Glock 26 is also very compact as is the SIG 224 (the smaller version of their classic 226). While larger calibers may do more damage they are bigger, heavier and kick a lot harder than a 9mm. Plus, being one of the most common pistol calibers around, the 9mm is widely available and typically enough to take down just about any baddie you’ll run across in the post-apocalyptic landscape. And even if you don’t take them down, you’ll definitely slow them down in the least. Let’s face it, a pistol is handy and easy, but it alone won’t save you from the crazies left roaming the earth after a global disaster. As far as doomsday weapons are concerned, you need real stopping power and nothing stops quite like a shotgun. 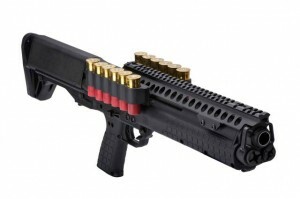 If you can get your hands on one, the Kel-Tec KSG shotgun makes all others practically obsolete. With a 14+1 round capacity and at a scant 28″ in length this gun is enough scare off any baddie with sense. Shotguns, by definition, offer powerful protection and are almost guaranteed to hit their mark when up close and friendly. In fact, for close quarters there is simply not a more devastating weapon known to man than a shotgun – making it an absolute must to survive a “kill or be killed” environment. One important thing to consider regarding shotguns, however, is that if you’re trying to survive – rather than shoot clay pigeons – you do have to be sure to use the right ammo. Anything less than 00 or #1 buckshot will more likely tick-off your enemy rather than take them down. I haven’t encountered any zombies personally but I imagine an angry one is more dangerous than the standard. 00 buckshot contains larger pellets compared to birdshot doing more damage and with greater force causing more catastrophic injuries. In addition to a defense weapon, shotguns are great for hunting. Assuming that Whole Foods doesn’t survive whatever catastrophe that took out most of the planet, you’re going to need a food source. Sure, you might be able to get away with fruits and veggies if the environment allows you to manage a garden. But even if that is the case, meat is always good to have. After surviving whatever it was that ended life as we know it, if you’re fortunate enough to have secured a place to hunker down you’ll want to protect it – from as far away as possible. A good .308 caliber hunting rifle – like the Remington 770 – will give you a range of 150 yards or more. That’s more than a football field away, so if you can see them first, you’ve got the advantage. Granted, not everyone is accurate at long distances, but even if you don’t get a kill shot, you’ll likely scare off anyone with sense. The M4 is standard issue for the US Army today and is a reliable and powerful assault rifle for your doomsday weapons collection. Even with the standard sights, most people can effectively hit a target with a rifle at decent ranges. Considering that even at 75 yards or so, enemies are still a good 10 seconds away from you even if they’re running full force. From what I’ve seen in movies, zombies never sprint, so that distance is more than enough to mow down a dozen walking dead before they get close enough to drool on you. Of course, if you’re fortunate enough to get a scope or telescopic sight you’ll be effective at even greater distances. While bolt-action or lever-action rifles would be a good start, a semi-automatic rifle would be best if you can get your hands on one. The iconic AR-15 is a great choice although my personal favorite sporting rifle is the Tavor from IWI. Both of those – and other similar semi-auto rifles – will send a potent 5.56 NATO round down range doing some real damage. Of course, a step up from a semi-auto sporting rifle would be a military assault rifle like the M4 or AK47. Unlike their civilian cousins, these riles can go full auto. But, if you want to get your hands on one before doomsday, you’ll need a special permit. However, assuming that most of the population was wiped out, you may have an opportunity to raid a police headquarters or army base after things settle down. In my opinion, the three weapons mentioned above will serve well enough as doomsday weapons for most post-apocalyptic scenarios. However, there are a few other firearms worth mentioning that might be good to have in addition to those. If zombies are the scenario and a headshot is the only kill method, a 9mm handgun might not be enough stopping power. In that case we might want to reconsider Dirty Harry’s .44 magnum – or any magnum for that matter. The extra power in those types of cartridges provides much more force and that’s a good thing facing an undead enemy. Of course, if we’re talking powerful handguns, you would have to consider the Desert Eagle. Firing a beastly .50 caliber round, there’s simply no more devastating handgun on the planet. But, if you’re planning on buying one to prep for doomsday, it’ll set you back a couple grand and the rounds aren’t cheap either – almost a buck round. Oh, and there is the possibility of breaking your wrist or nose while firing it – so handle with caution. 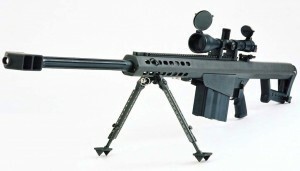 Rumored to be able to hit a target a mile away, the Barrett .50 Caliber is the daddy of all rifles. As mentioned earlier, an good hunting rifle or assault rifle would be a great asset to protect both yourself and your property after an earth shattering disaster. Protecting your perimeter would be even easier if you could get your hands on the Barrett .50 caliber sniper rifle. With a range of over 1,000 yards – and firing a .50 caliber BMG round – you literally could take off limbs with that behemoth. That power does come with a risk, however. Firing one of the most powerful rounds on earth means this thing kicks like an army mule. So this is another gun you’ll have to be extra careful firing or a black eye will be in your future. 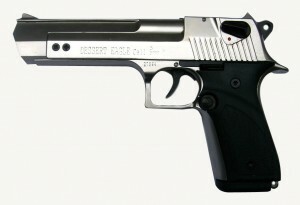 Also, like the Desert Eagle, it’s pricey – over $8,000 and ammo can cost $5 to $10 per round. So, you might want to wait until after doomsday and pick one up at an abandoned military base and put that money towards other things preppers recommend. So, that concludes my recommended doomsday weapons. Personally I can’t imagine any doomsday scenario where any gun wouldn’t be an essential piece of equipment. That being said, as always with firearms – use/store/handle them with extreme caution. Remember, every gun is a loaded gun. What’s the Sidearm Choice of Your Favorite TV Crime Fighter? There are more powerful handguns around!